The launcher has several options for working with D20PRO (connect as a player, hosting a game, managing your account). 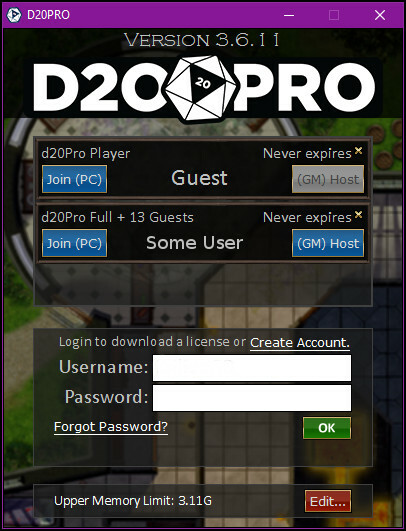 Create Account opens a dialog and allows you to create your D20PRO account. 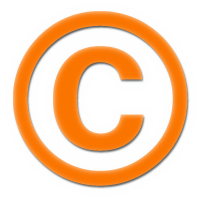 This is used for managing your license and Marketplace purchases. If you have forgotten your password, you can verify your account and reset your password here. On the bottom of the launcher is a button for Upper Memory Limit, which shows the current allotment. It is suggested to use 1/2 your total RAM or less. 2g to 4g should suit most common users. You will need to close and relaunch D20PRO for this to take effect. 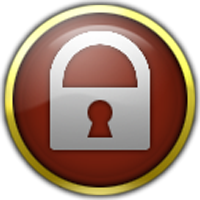 The lock symbol is typically a result of the program not having enough RAM to load the assets and thus it uses a lock symbol as a placeholder. It is rare, but it can also be a case of trying to use encrypted/copywrite assets on a map. Licenses allow you to host games or join a game as a player. Please see Licenses for more information on this subject. Join (PC) - Using the guest account is a free license; the GM will need a purchased Guest Seat for you to join the session. (GM) Host - Allows you to host a game a game session for players to join, is only availible during your Trial evaluation. Join(PC) - Allows you to connect to a host. The host does not have to have an associated guest seat and your connection does not count against the Hosts number of seats. (GM) Host - Allows you to host a game session for players to join. It can be helpful to run the D20PRO application as Administrator, especially if your installation is inside the /Program Files/ sub folder on a Windows system where UAC is an issue. Locate the D20PRO.exe, right click on it and select Properties. Check the box that says 'Run this program as administrator'.